Last year, I shared a recipe for delicious, seasonal Pumpkin-Pecan Scones with Maple Glaze. 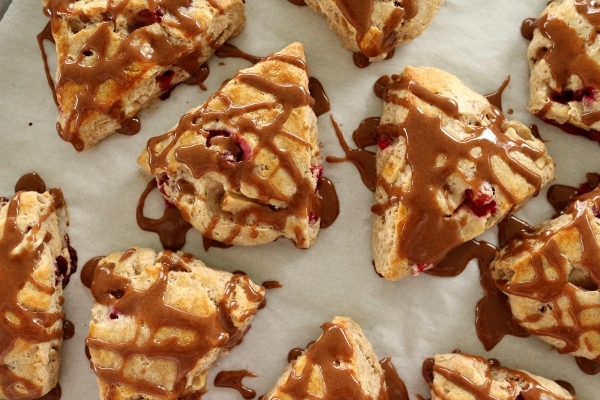 Today, I'm sharing another scone recipe that's perfect for fall! 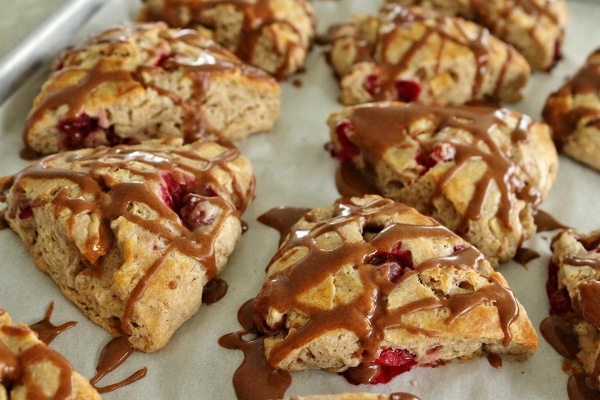 These Cranberry-Apple-Cinnamon scones combine the essence of apple pie with the bright, tart flavor of fresh cranberries--two very prominent ingredients this time of year. 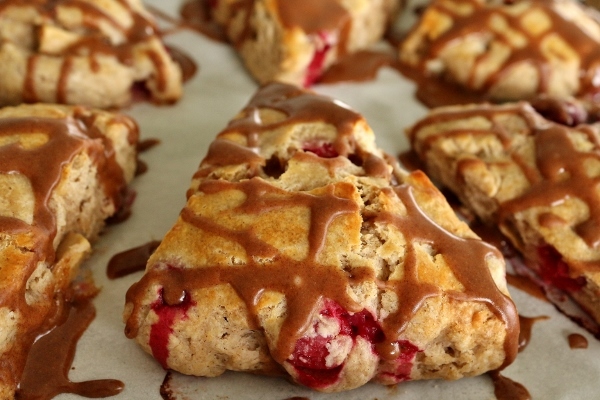 And then the intense cinnamon glaze really takes these fragrant scones over the edge. These scones freeze beautifully. In fact, that's what I did. I cut them, froze them, and then baked them straight from the freezer. By freezing these scones, it actually prevents the apple from oxidizing, which is why they should be either baked immediately or frozen and then baked. You can always just bake off a few at a time, and cut down the glaze recipe to make just as much as you need for a portion of the recipe. Also, these scones are best the day they are baked, otherwise the fruit starts to soften the scones rapidly, and even the glaze will soften even after it's already set. They are still delicious, but the texture won't be the same. When fresh out of the oven, they are the epitome of fall, lightly spiced with fresh sweet apple and tart cranberry, all wrapped up in a deliciously tender breakfast treat. In a large bowl combine flour, sugar, baking powder, cinnamon, cardamom, and salt. Add cold butter cubes to the flour mixture and work the butter into the flour mixture, using your fingers or a pastry cutter, until the mixture resembles coarse pea or dime-size crumbs. Be careful not to overwork the mixture or the butter will soften too much and the resulting scones will not be flaky. Add the apples, and cranberries and toss well. Mix together the buttermilk and beaten egg and then add to the flour mixture and mix until just combined, kneading lightly (but don't overwork it). Stir together the confectioners' sugar, cinnamon, and milk until smooth. If the glaze is too thin, add a sprinkle more confectioners' sugar. Too thick, add a drizzle of milk. 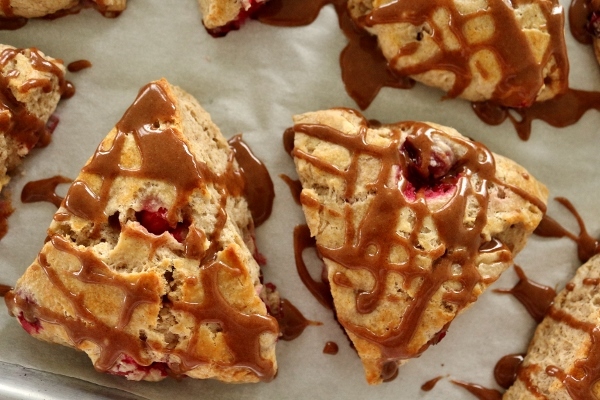 When scones are cool, drizzle the glaze over the tops. Allow the glaze to set briefly and then serve the scones at room temperature. These scones are best the day they are made, otherwise the moisture in the fruit with begin to soften the scones and glaze.